Swedish hero of the Holocaust. cal Jewish needs of this hour. Beth David, Tempt Beth fel. world, and right here at home. As Jews, we are one. but what we do about those beliefs. impression being given is that only Israel pulls them. show of force in Poland? ity Adviser Richard Allen, who accepted "gifts"
everyone else can do damned well what they please. What Happened to Polish Jokes? the proliferation of international terrorism. Jews are at the core of a world struggle for decency. the IRA in Ireland, the PLO in the Middle East. less Polish joke disappeared to? , able does it seem to some. 2200 N. Federal Hwy Suite 208. Boca Raton, Fla 33432 Phone 366-2001. SUBSCRIPTION Rates Local Area S4 Annual (2 Year Minimum n 50). or by membership Jewish. Semitism is not pervasive in Pro. Christendom is infected by it. | world and here at home." and the Israel Education Fund. new Hyatt Hotel. Donation $25. Stage Co. of Palm Beach. Side" by Sondheim at Stage Co. Tariff will be S25 per person. "The Chosen" by Chaim Potok. nolds in Jupiter at noon on Mar. "CdLL TOR OUK hO W KATES"
Thursday. Jan. 28 at 12:30 p.m.
will be given to lucky winners. of Camera 12 on Channel 12.
pal Church in Wellington. Rev. lage Hall in Royal Palm Beach. tury Village on Okeechobie Blvd..
Jewish War Veterans Poat No. on Tuesday, Jan. 19 at 12:30 p.m.
ization of America served to all volunteers. ten berg and Lou Waldman. Norwich; Louis Bailey, Oxford; Louis Weins.ein. Waltham; and Sam Durbin, Wellington. Israel Friday night at 1901 N.
Tlagler Dr., West Palm Beach. at the Breakers Hotel. Mrs. One-way, Midweek Tourist on 6:15pm nonstop. $1191YW8D) Fri.. Sat., Sun. on this nonstop. day. Not available on flights via New Orleans. during certain peak holiday periods. B Abe and Gloria Belgard. Mr. and Mrs. Milton G.
at The Breakers on Sunday, Jan.
chairman. Since his death, Mrs.
Council of Jewish Women. Mrs.
1982 reception will be Arthur H.
Hausman, Carl Leff, Samuel J.
Louis Schraeder, 689-3124. Thank you. which must be valued annually. about Israel? The Miracle on the Mediterranean."" not hear the prayers of a Jew,"
had spoken out of ignorance. reth and other Christian sites. modem Israel of the Jews. plicated than the PLO indicates." in Soviet or PLO policy." Make Amends for his Words." as an official observer at this national conference. 5856870 COSMOS TRAVEL 12 S. Dixie Hwy. Please join us for Wine and Cheese. ade jointly by Rabbi Howard J.
sgler Dr., West Palm Beach. 9 a.m.-noon. Jan. 13-March 3. 1-3 p.m., Jan. 13-March 3.
ing Thursdays 1-3 p.m., Jan.
JCC Thursday, Jan. 21 at 2 p.m.
day, Jan. 21 at 12:45 p.m.
BEVERLY GOODMAN, "A PSYCHIC LOOKS AT LIFE"
FOR INFORMATION ON ALL SINGLES ACTIVITIES. CALL THE JCC AT 689-7700.
void. 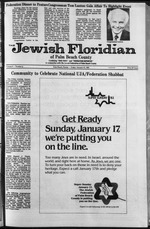 Begin had accused the U.S.
by then Premier Yitzhak Rabin. tion on Middle East issues,"
bution to the peace process. an issue vital to its security. that it will never return tod. sponse, he said, was a breach I*! lateral action all the more seriou. Sholom and Victor Duke, Chairman of Entertainment. crimes. Mengele is believed to be living in South America. The photograph was needed for identification. ITS DESTRUCTION for alleged "constitutional"
theless have ordered an investigation. warran't.for Mengele's arrest was renewed early this year. periments which resulted in death. gram lor 5 and 6.
tat Happened to Polish Jokes? I name of Poland today. \ruint t0 ^p *u^d tne Jewian Chapel at the Academy. -but all of us are anxious to see the Jewish Chapel built. Sanders F.O. Julian Almeida F.D. alarmed we ought to be. and Sol Margolis, President of Century Lodge, B'nai B'rith. Ao/I coming soon to North Miami Beach. in the Lona Wershaw Social Hall. The Performing Arts Of Today." Monday evening, 7:30 p.m., Jan.
will be "Fear of Success." on Tuesday mornings at 10 a.m.
are taught on Monday evenings. on Sunday, Jan. 17 at 9:30 a.m. Preview beginning at 7:30 p.m.
rant, West Palm Beach, on Jan.
499 9229 Harry Silver. President Daily services 8 a.m. and 5 p.m.
Speiser Phone 689-9430 President, Gerson Felt. a.m., 6p.m. Mincha followed by Sholosh Seudos. Beach* Phone:845-1134 Rabbi William Marder Cantor Earl J.
Rackoff Sabbath services. Friday at 8 p.m., Saturday 10 a.m.
Friday at 8:30 p.m, Saturday at 9 a.m.
trail reader's the notes of the reading of the Torah. Shown with Mr.
e immediate Past President of the Day School. [Sisterhood 12:30 p.m. B'nai B'rith No. 3016 7:45 p.m.
ISholom Sisterhood 1 p.m. Hadassah Henrietta Szold 1 p.m.
ITemple Israel Board -8 p.m. B'nai B'rith No. 3041 -8 p.m.
INOON HYATT HOTEL Labor Zionist Alliance 1 p.m.
from cultural and other bias. for them continue to be valid. shown to be v -ealistic . action to meet the goal." and motives behind the move. and Observers (MFO) in Sinai. the basis for the MFO. in Israel's move on the Golan.